Christmas Stamp it Out! – Saturday 3rd November 2018. 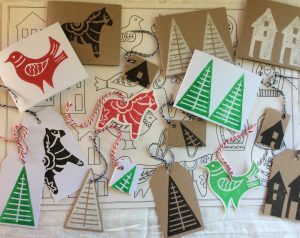 To get your festive to do list firmly on track, join me at The Slipper Studio to design and cut your own Christmas stamps and create your own beautiful bespoke cards, gift tags and hanging decorations. With the workshop in early November you will have plenty of time to continue making your cards at home and even meet the 2nd class postal deadline. Saturday 3rd November, 10 - 4pm, £65, including materials and refreshments; please bring your lunch. For further details and to book, please email me: enquiries@lizwellby.co.uk.